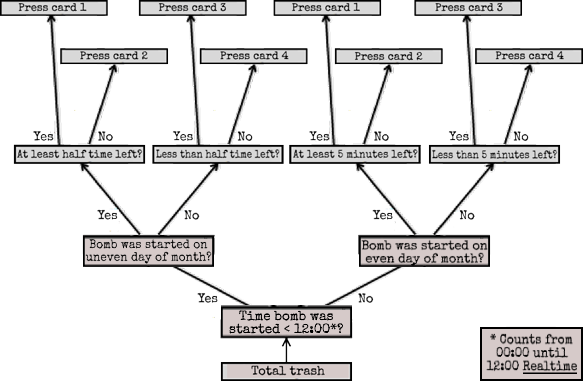 A game of luck when defusing bombs, except if you can cheat luck. Welcome to Casino "Heart of Cards"! Today, we’ll play a modified Four-Card Monte. Please read the rules below. When ready, press the deal button. Four cards and coins will be presented. To win the game, you will need an appropriate bet and choose the correct card after they’re shuffled. To solve this module, you need to send the money you won to your card number, via the device handed after winning. Step A: The house rules. Step B: The correct coin and card. To win in Four-Card Monte, you need to follow the correct card and, after a shuffle, find it again. You also need the correct bet. The correct coin (or bet) is decided by the cards and coins that are dealt to you. If your first card is an Ace of Spades and a lit BOB is also present, then press the 1st coin. Otherwise, if your last card is a Jack of Clubs and you have more than 1 red coin, press the 4th coin. Otherwise, if a Queen Of Hearts is present and there’s any king present as well, press the 2nd coin. Otherwise, if an Ace of Diamonds is present and you don’t have duplicate coins, press the 3rd coin. Otherwise, if all cards are from different suits, press the 1st coin. Otherwise, if there are 2 Spades and 2 Clubs, press the 2nd card. Otherwise, if you have 2 Hearts and 2 Diamonds, press the 4th coin. Otherwise, if you have 2 pairs, press the 3rd card. If none of these apply and the serial number contains a vowel, take the last digit of the serial number. if it’s higher than 4, subtract 4. If you get a 1, press the 1st coin. If you get a 2, press the 2nd. Etc. If THAT doesn’t apply, take the first digit of the serial number and do the same as above. Keep in mind that after you choose your bet, the cards will be shuffled. You need to check the correct card before moving on. 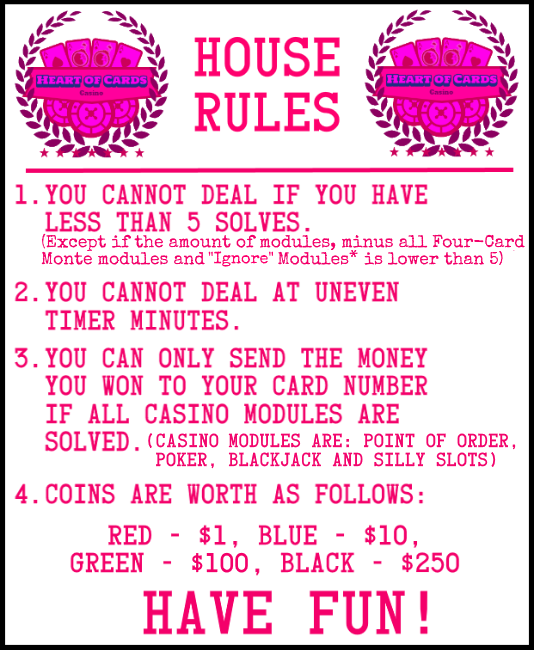 Also, remember the value of the coin you chose, as it will be used for the prize calculation at step C1. The card that should be found after the shuffle, is decided by card combinations and the flowcharts below. If you have 4 of the same suit, all different ranks*, you have a "Four-Card Deluxe". Else, if you have just 3 cards of the same suit, you have a "Three of a suit". Else, if you have 4 of the same suit, of any rank*, you have a "Four Flush". Else, if you have exactly 1 King, 1 Queen and 2 Jacks, you have a "Kingdom Combo". Else, if you only have exactly 1 King and 2 Jacks, you have a "Royalty Rush". 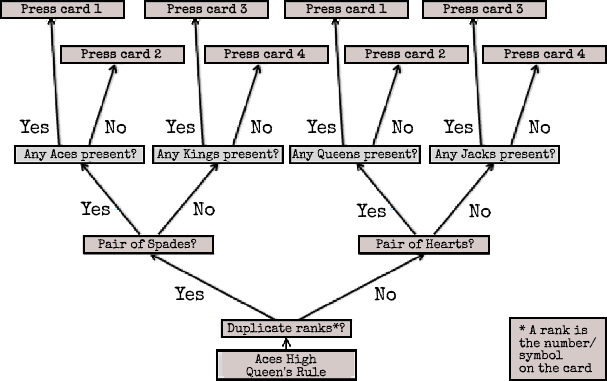 Else, if you have 2 or more Aces, you have an "Aces High"
Else, if you have exactly 1 Queen and 1 Ace, you have a "Queen’s Rule"
Else, if you have 2 pairs of suits, you have "Dual Pairs". Else, if you have 2 hearts, you have a "Lucky Love". Else, if you have none of these, you have "Total Trash"
Find the flowchart that matches your combo and find the correct card there. Flowchart: "Four-Card Deluxe" and "Three of a suit". Flowchart: "Kingdom Combo" and "Royalty Rush". Flowchart: "Aces High" and "Queen’s Rule". Flowchart: "Lucky Love" and "Dual Pairs". Step D: Winning and sending the money to your credit/debit card. If you chose the correct card, then congratulations! You won! All you need to do now is input the correct amount of dollars and cents on the device you just received and send the money to the card number displayed above. Lastly, add the number to the value of the coin you pressed. Input the amount of dollars in the device. If it’s lower than 100, you can enter in the 2 digits and press the "Cent" key, to switch to cents. It will automatically do this upon entering 3 digits. For the 10 cents digit, take the digit in the card number that is in the position of the first digit of the serial number, plus 1. For the single cents digit, perform the same action, but in the position of the last serial digit, plus 1. After inputting the correct amount, press the green button to send the money. Appendix $: A list of Royal_Flu$h modules. Down below is a list of compatible Royal_Flu$h modules until the 17th of March 2019. Only these modules are compatible.